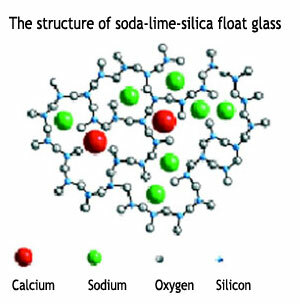 For practical and economic reasons, the high melting point and viscosity of silica is reduced by adding sodium oxide (a flux) in the form of a carbonate and the sodium-oxygen atoms enter the silicon-oxygen network, in accordance with their valency states. These atoms are known as Network Formers. Other major constituents of Flat Glass: Calcium and Magnesium enter the network structure as Network Modifiers and the action of these modifiers is to make the structures more complex so that when the components are melted together, in the cooling process, it is more difficult for the atoms to arrange themselves in suitable configurations for crystallisation to occur. 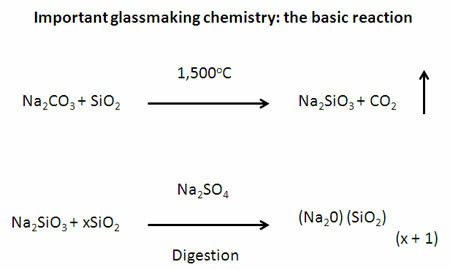 In the glass making process, the cooling rate is arranged such that viscosity increases and the mobility of the atoms is hindered thus preventing arrangements and crystallisation from occurring.